After having The FabEllis Two in February, I knew I wanted to have another event soon. I'm excited to share that I will be having a Meet and Greet at Bijuju in Raleigh, North Carolina on Saturday, May 4, from 1-3 p.m. 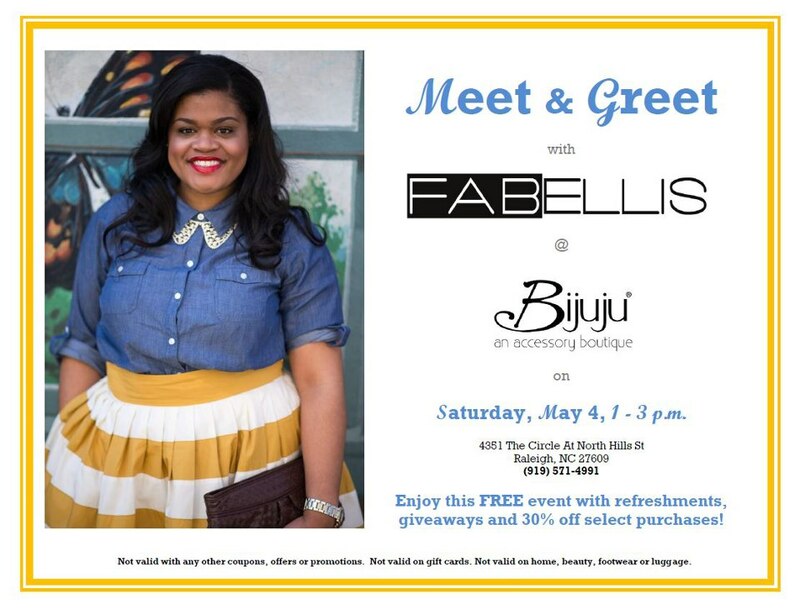 This FREE event will include refreshments, giveaways and 30% off select items. I would love to see you there. Feel free to drop in! Also, to stay in the loop with any updates, please RSVP here. NICE! Wish I lived closer : ). I am sure it's going to be great! You won't see me there but I'm posting on le blog NOW so that my GLO girls in your city will have a chance to attend! Also, whats your RSS feed link? Here you go boo! Good luck with your event! I will definitely be in attendance!! !